A new official battery case for the iPhone XS or possibly the XS Max may be available soon. This possibility has arisen from clues found in the code of an Apple software beta, which has resulted in accurate predictions about upcoming products in the past. 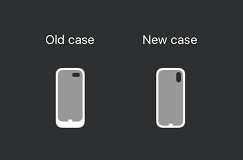 This case, should it exist, has undergone somewhat of a design update to match the new iPhone. Apple has released official branded battery case for its iPhones in the past. This trend started with the iPhone 6; however, the iPhone 8 line and iPhone X somehow never got one. Now, however, it appears that the Cupertino giant has resumed development for this product, so that it supports the iPhone XS at least. This prospect has been raised by 9to5Mac, which claims to have found an icon in a software beta possibly depicting a battery case. The beta in question was for watchOS (5.1.2 beta 2), and appears to show a case outline in white, with a grey insert that may reflect the placement of a battery pack. It closely resembles one for an older phone (possibly the iPhone 7), in which the grey area clearly recalls the bulge ending some way above the bottom edge. The new case, however, is clearly for a 2017 or 2018 model with a dual camera. This rules out the iPhone XR, and most likely refers to an iPhone XS, as the dimensions of the icon may fit it the best. The putative battery case has undergone something of a design revamp. Its 'battery pack' now covers nearly the whole back panel of the phone, indicating that it is perhaps more streamlined and pocketable compared to those for previous iPhone generations. However, it is also possible that Apple have not moved further on this concept, as fans who have already paid the price for its latest flagship may not be willing to pay yet another US$99 (the approximate price for the branded battery cases of the past), even for more screen-time.